In a large, nonstick skillet or wok on medium flame, heat canola oil and sesame oil until shimmering (about 2 minutes). Add eggs and lightly scramble; remove and set aside. To the same skillet, add garlic, onions, and carrots; sauté until slightly tender (about 4 minutes). Fold in peas, eggs, rice, chicken, soy sauce, and black pepper. Continue to sauté, stirring until all ingredients are thoroughly warmed through (about 4-6 minutes); serve warm. 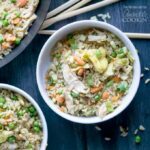 This recipe for Chicken Fried Rice was printed from AmandasCookin.com - https://amandascookin.com/chicken-fried-rice/ and can only be printed for education or personal use.